When operating a pool, especially a large commercial pool, conserving swimming pool energy should always be a high priority. Pools are expensive to maintain and operate, so any extra energy loss should be avoided. But how exactly does a pool lose energy? Let’s go over a few types of energy loss that you may come across while operating a pool. At the surface of a pool, water is constantly changing into water vapor. Evaporation is a chemical reaction that requires energy. The heat required for this chemical reaction leaves the pool water, lowering its temperature. In fact, evaporation causes about 50% of all energy losses in a pool. The rate of evaporation can be increased by several factors. These include high wind speeds, high air temperature, low relative humidity, and high water temperature. When water evaporates, a pool operator must fill the pool, lowering its temperature even further. This increases swimming pool energy losses. You know when you blow on a spoonful of hot soup to cool it off? This is convection energy loss in action. When heat transfers from the surface of a pool to the cooler surrounding air, you are losing convection energy. Convection losses account for about 15-25% of total energy loss in a pool. When you feel the heat from a fireplace while sitting across the room, you are experiencing thermal radiation. Different from convection losses, thermal radiation happens when a warm pool radiates heat into the sky above. The swimming pool energy losses from from thermal radiation account for about 20-30% of the total heat loss in a pool. More heat is lost when there is no cloud cover, there is high humidity in the air, and the pool has a relatively high temperature. Conduction swimming pool energy losses are the only losses in energy that do not occur on the pool surface. Conduction is the movement of heat throughout an in-ground pool’s internal structure. This form of energy loss only accounts for 5% of a pool’s energy loss. 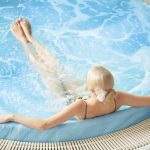 It is also important to note that pools built in a high water table environment will have a higher rate of conductive heat losses. For those in pool operations, it’s important to obtain a thorough understanding of how swimming pool energy losses occur. During CPO® certification training, you learn about how pool covers, wind blocks, and proper maintenance and use of heaters and heat pumps can reduce energy losses. By minimizing energy losses, commercial pool facilities save a ton of money which they can put back into the business. Learning these topics will make you a more valuable employee as a pool operator. For a more extensive look into energy conservation, take a course in pool operation. 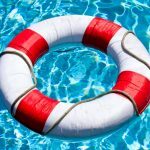 Our expert services include award-winning CPO certification courses, residential and commercial pool maintenance, consulting, and we can also serve as experts in pool-related legal disputes and trials. Stay safe and clean with our swimming pool products. Test kits, pool signage, pool cleaning accessories, pool safety items, log books and more. Don’t see it here, call us and we will find it for you! You can learn from the experts about pool safety and management. The CPO® certification class is a great start to becoming a pool expert. Pool Operation Management’s award winning CPO certification courses train you how to properly operate a swimming pool in the most energy-efficient way. Our two-day courses offer a wealth of information and training in everything from pool chemicals, to energy conservation to risk and liability. For the very best in pool operation, contact us today.